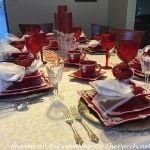 Welcome to the 180th Tablescape Thursday! Valentine’s Day is just a few days away. Did you forward your Valentine’s Day cards to the Valentine, Texas Post Master to have them postmarked with their famous stamp? Such a cute idea! We’ve been having spring-like weather for weeks here in Georgia. Even the daffodils are in full bloom. The porch was calling, begging me to come out and play. Just look at all that glorious sunshine! 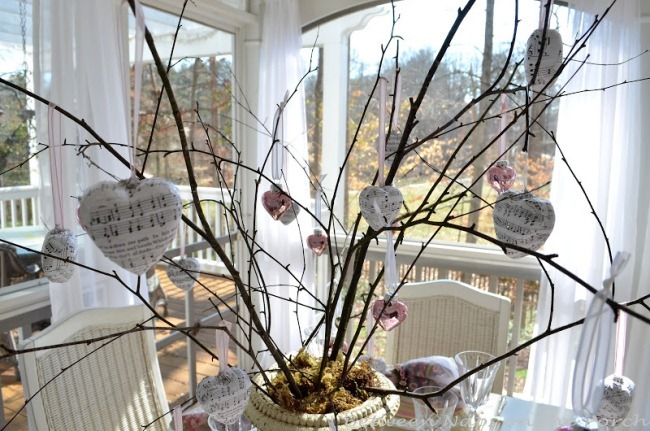 The centerpiece is just branches gathered from the yards, decorated with little pink mercury glass hearts and some I decorated with photocopied snippets of sheet music. 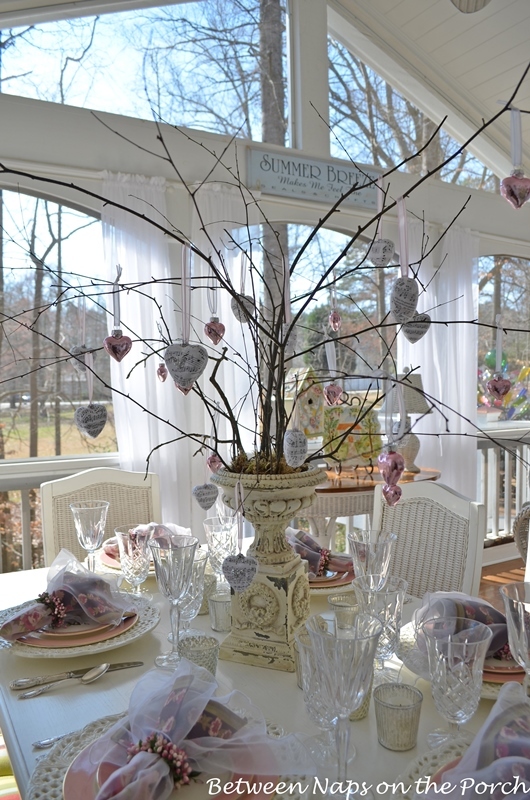 This would be a fun setting for a group of girlfriends around Valentine’s Day or even a sweet Mother’s Day setting. 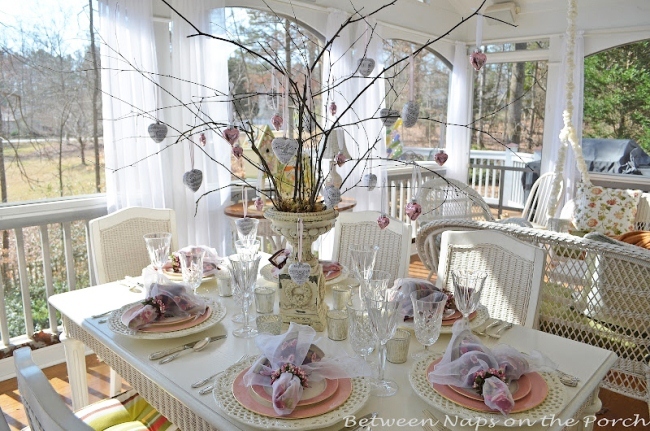 I could also see this as a sweet table for a bridal shower…just expand this idea for a bigger gathering. Sheer napkin sheaths are layered over April Cornell napkins found while antiquing a few years ago. On another past antiquing adventure, I found 27 pieces of this International china for just $14. I filled in with a few more pieces from eBay. The pattern is Glenwood and depicts a pretty gardenia in the center. Homer Laughlin made this same pattern…not sure of the pattern name, though. The stemware sparkled in the beautiful sunshine. Iced tea glass is Waterford, pattern is Araglin. The goblet is Vendome Clear by Noritake. 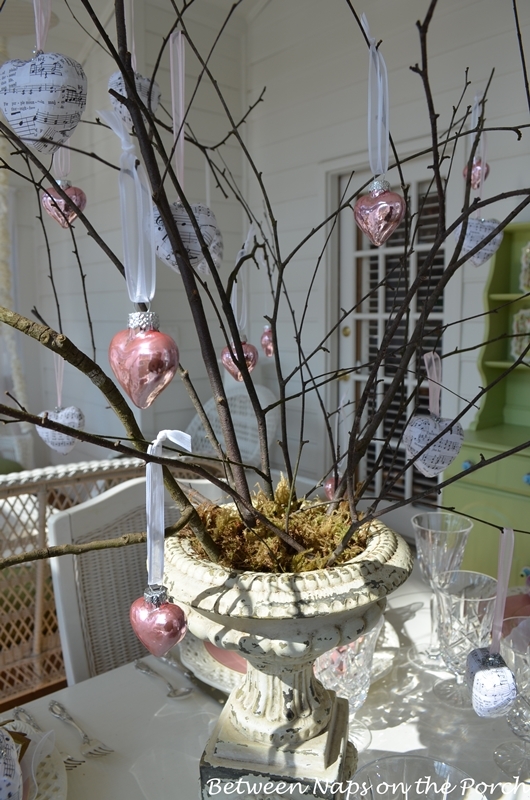 I wanted a simple centerpiece for this Valentine’s Day soiree, so I gathered shed River Birch branches from the yard and tucked them down inside a shabby urn. You may remember this urn from this summer table setting when it was filled with roses, daisies and Creeping Jenny. 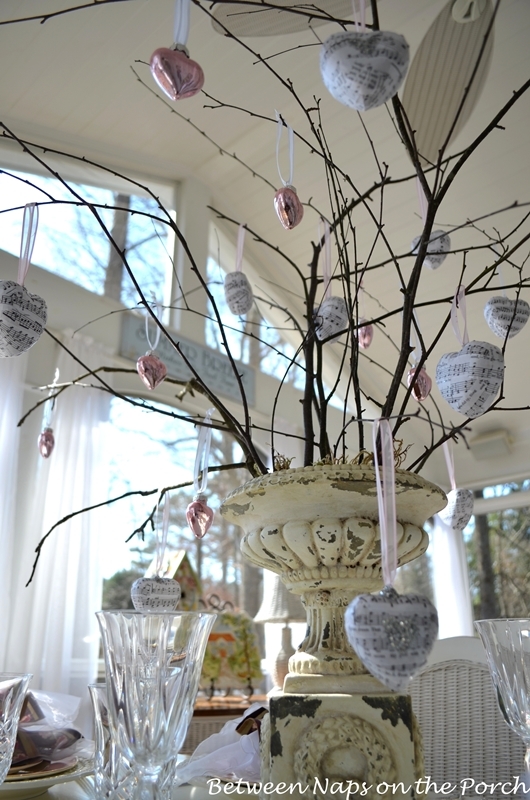 The branches were adorned with pink mercury-glass hearts and hearts decoupaged with photocopied sheet music and glitter. Today, we’ll imagine the music is all love songs. Recently I saw papier-mâchéd, music-covered hearts on Etsy and I decided to try making my own. I’ll post a little tutorial showing how I made them soon. (Update: You’ll find the tutorial for decoupaging the hearts here: Decoupage Hearts with Sheet Music) These are not papier-mâchéd, they were actually much easier to make than that. I didn’t antique the music/paper, just left it white to contrast against the branches. It would be easy to “antique” the sheet music for an aged look, though. I added a little, silver-glittered heart in the center of this one. I tucked moss (left over from THIS mossy table setting) around the base of the River Birch branches. On Tuesday evening I was able to snap a few pics during the Blue Hour. (You can read all about the blue hour, HERE.) Isn’t that just the most amazing color of blue? And I didn’t do anything to this photo, no editing at all. This is how it came out of the camera. The blue hour is amazing, isn’t it? 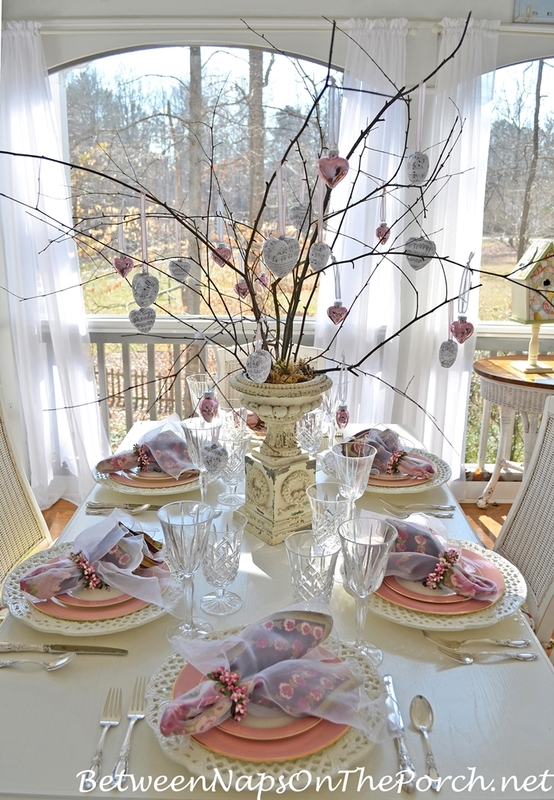 You’ll find additional Valentine’s Day table settings here: Valentine’s Day Tablescapes. It is a beautiful bright day for your lovey Valentine's Day tablescape. I love those pink dishes and all the lovely romantic accents. 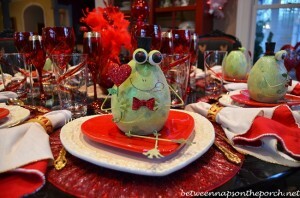 Looks like you are serving up a heap of romance! Such a beautiful romantic table. I love the layered napkins. Glad I checked your blog early this morning! How fun to get to see a table set on the porch again! Your centerpiece is stunning — and what a great idea for various holidays or special occasions. Love the fluffy look of the napkins! Lovely table. I am looking forward to the tutorial for the hearts. I love the idea of the Valentine tree. Susan, I appreciate the tips and instructions you share in this world of blogging. Thanks, Mary! I didn't plan the blue hour shots…got lucky with my timing. Thanks, Tricia! 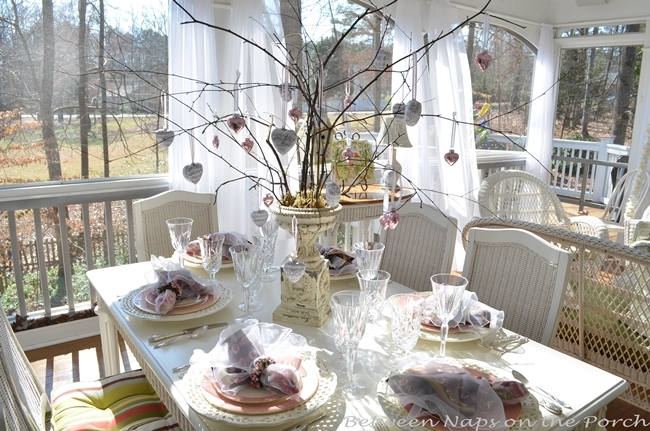 I was just thinking how easy it would be to spray paint the branches white for a spring table setting. Ummm, maybe with Easter eggs hanging from it. I love the soft and romantic look you have created. Oh! to be able to eat out on the porch already. 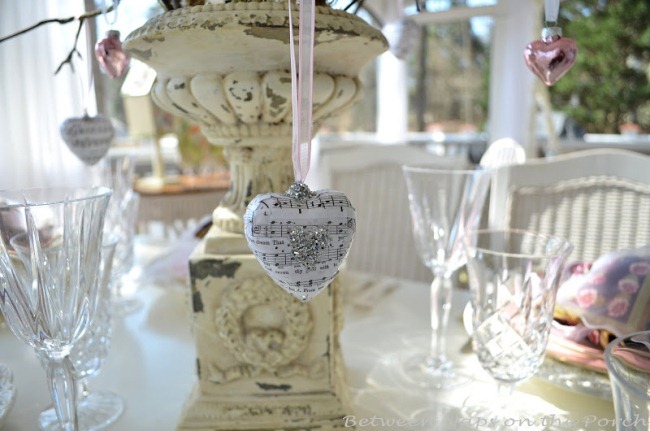 Gorgeous as always…just love the feminine notes and the misic hearts! Sorry, Susan. I linked thinking it was Table Top Thursday – not Tablescape Thursday. My vignette doesn't fit in with the beautiful valentine tables. Your table is so ethereal. I think it is my favorite of all that you have done. I really love this table Susan and the decoupaged and glitter hearts are so charming! This table is so light and airy…just love it and I would guess I would want to play on your porch everyday of the year! I love the pink and white table, Susan! My table is an extra special one this week and then I almost forgot to link it! The table is dedicated to my Valentine J, who was unexpectedly hospitalized while we were on the road last weekend. Your table is b.e.a.U.tiful 🙂 Thanks again for featuring my bookshelves on Tuesday. I just linked up my tablescape. Have a great day! I am so jealous you can eat outside! We have a coat of snow today, SPring is a long way off! I love your table, so pretty and feminine, perfect for a Ladies Lunch. The tree is adorable. 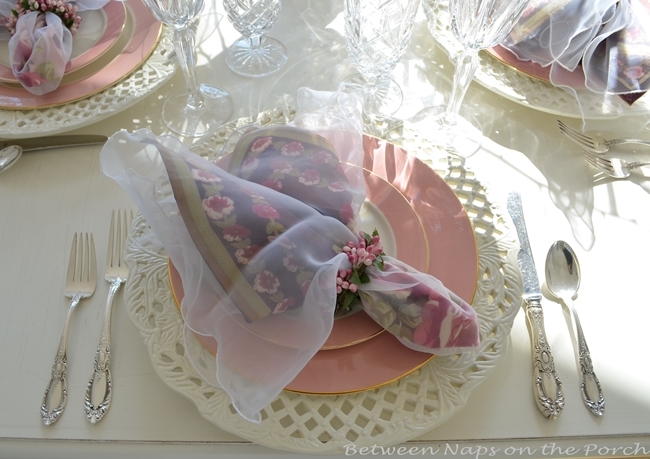 This tablescape is soft and serene and subtly romantic. It's gorgeous in full sunlight, and the mood completely changes during Blue Time. I love it! Thank you for hosting this fun event! Hi Susan! I've not been able to join in on the fun is quite a while and I'm so happy to join you today! I'm not sharing a Valentine's tablescape, not ready for that yet! I did get up early to get ready for your party! I'll be sharing a Dark Thirty tablescape! Thanks for hosting, you are the best! 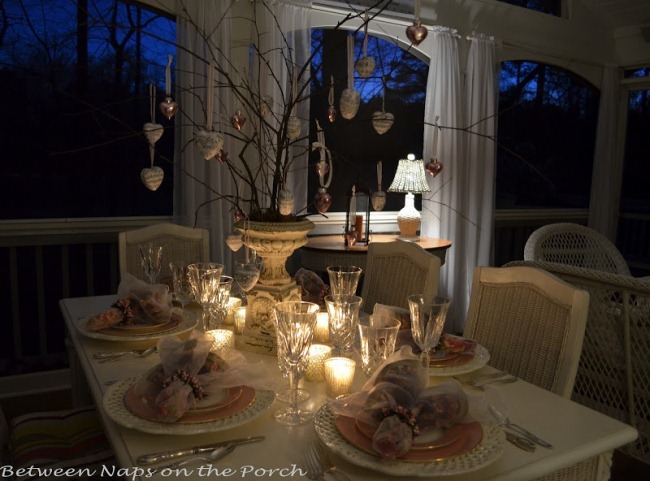 Your porch tablescapes are some of my favorites! This one is so light and airy! Love the centerpiece! All very romantic! Don't taunt me with the sunshine!!!! It has been gray and gloomy and cold here in the Kansas City, Mo. area, and I do NOT like it! I just want my sunshine back!!!! This is such a pretty, feminine table! I love the design of the centerpiece as well as the gorgeous urn that is its base. It is the perfect combination of shabby and chic! Have a great weekend, and Happy Valentine's Day to you! Susan everything is gorgeous!! 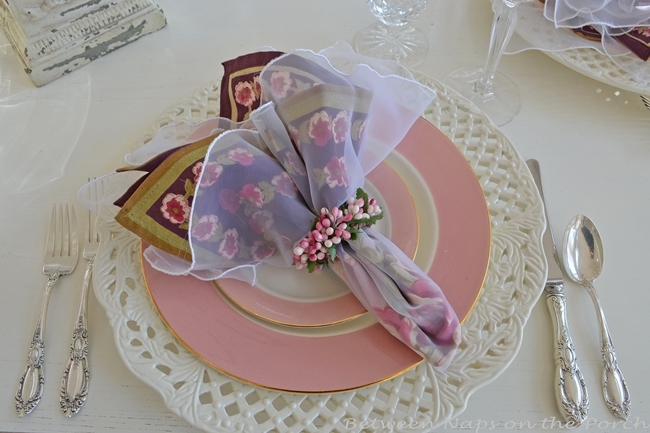 I love how you used the sheer napkin over the floral napkin for a romantic look! So beautiful. The centerpiece ideas are fantastic! 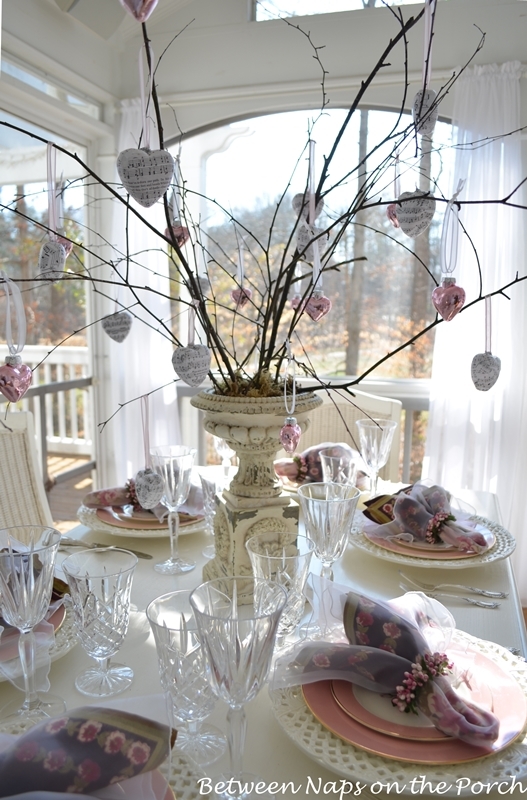 I have been wanting to use tree branches in a tablescape too…It really gets me thinking about my next tablescape! Thank you for using my napkin rings in your tablescape!! They look stunning in the photos and of course in real life hehehe. Thank you for hosting and come link up to Centerpiece Wednesday to show off your centerpieces!! This table is so pretty and light filled! I love those romantic vintage plates! Gorgeous! I love ittttt!!! Fav of course is the centerpiece and also the way your wrapped the napkins. LOVE IT and the night shot…. makes me want to climb back in bed and get romantic. Well, climb back in bed anyway! Beautiful Susan! So romantic. Adore the pink plates. The hearts are so cute hanging from the "tree". We use birch branches and hang feathers and eggs for Easter, so I get a very light and spring-y feeling looking at the centerpiece. Can´t wait to see the tutorial of the music hearts. Beautiful tablescape. You really captured the barren winter landscape with the soft hues of the table. The pink dishes are beautiful! 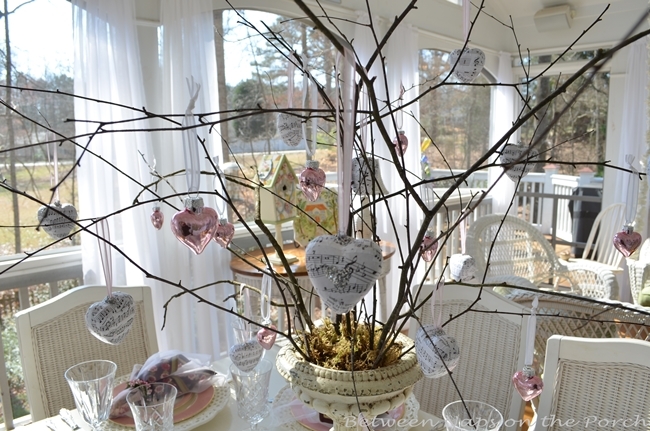 I love the centerpiece Valentine's tree and by all means it's not simple, is fabulous! Happy Valentine's dear Susan and thank you for hosting and having me. That tablescape is gorgeous! How clever to do your centerpiece like that! I love that look! 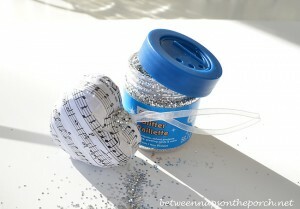 Your music notes hearts – another talented look, love! GREAT find on the china whoooo hooo! Lovely, thank you and thank you for a wonderful link party. This is STUNNING!!!!!! Love it! Thanks, Shirley. They are really easy to make…will work on that tutorial today and get that up for tomorrow hopefully. Cindy, nope, no special setting. The blue hour is just a brief little window each morning and evening. Click on the link in the post and it will take you to another post that explains all about it. That other post also has a link to a site that will tell you exactly when the blue hour occurs in your area. I love taking pics during that time…the sky is just so beautiful! 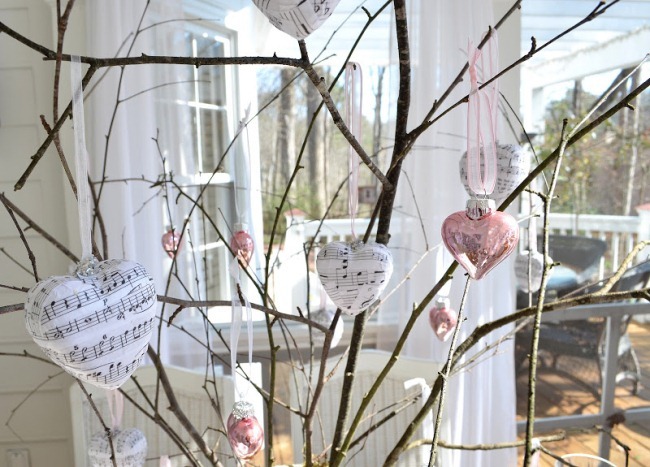 I love the idea of the branches for a Valentine tree! I have used that idea for Easter for eggs. I'm envious of your spring like weather, but we have had a very easy going winter so far so I guess I need to be grateful for that! Your new plates with the rose are so pretty and I love that pink banded trim. I'm afraid to be out on my deck right now you'd need a parka, boots and mittens!! 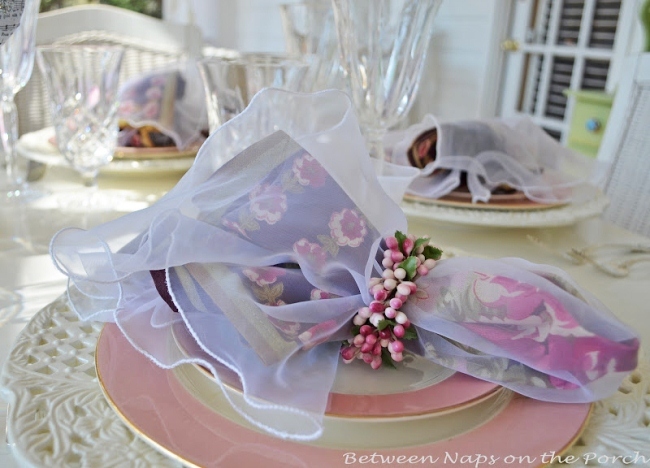 Love how you did the napkins too- so soft and feminine! Sanna, that sounds wonderful! I toyed with the idea of attaching feathers to the tops of the hearts…to soften the whole effect. Feathers would be so cute for an Easter "tree." Great idea! Yes, you'll LOVE taking pics during the blue hour. You may need to use a tripod, although I didn't for the pics I took. Tripod does help, though. You're going to be shocked how completely dark it has to be outside before the blue hour arrives. Just go to the site mentioned in that older post I linked to, and it will tell you the time of the blue hour for your neck of the woods. Have fun! How wonderful must a day on your porch be! 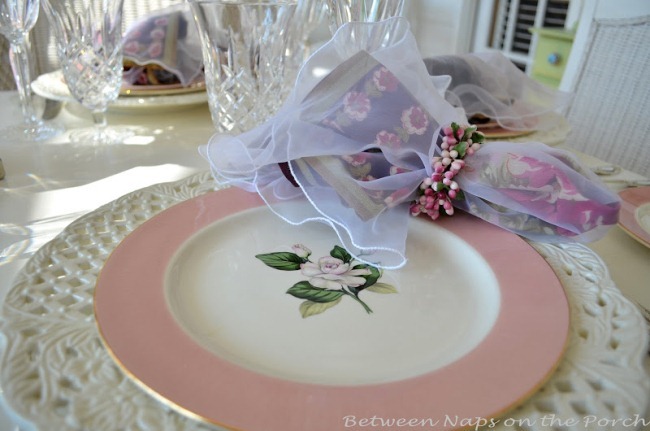 Love your setting, and the sweet pink vintage china is gorgeous, one of my obsessions! Your Valentine tree is wonderfully creative. So glad to join in today. lol I know what you mean! I just make a half a batch and that last at least 3 weeks. You have really outdone yourself with this tablescape. It's just exquisite. Somehow the way you connected your table setting with the outdoors makes it even more romantic. You are really an artist, Susan. Thanks, Fabby! Happy Valentine's Day, to you and your sweetie! Awww, you are so generous with your kind words,, Junie. Thanks, sweet friend! How pretty Susan! Who would have thought that we would have a Valentine's with weather that would have us on the porch? Loving the mild (well mostly) weather. Love your pretty love tree as well. FYI check your local thrift stores for the big pretty storage containers to serve the coffee from with the spickit I have purchased two from a thrift store with in the past month and have seen four others there! Love this recipe yummy! Susan, You tables are always beautiful, but this one really touches me. So soft and romantic! I love it. Hi Susan, I recently bought the same glasses as you have pictured holding the iced coffee. We were on holiday in Cornwall (I am from England) and saw them in a garden centre and couldn't resist them. Love your blog and check in several times a week. Thanks for all the pleasure and inspiration you give to everyone. I green with envy over all that sunshine, Susan! It is still very cold & dreary up here in Ohio. I should have turned on a side tablelamp for my candlelight shots, like you did. 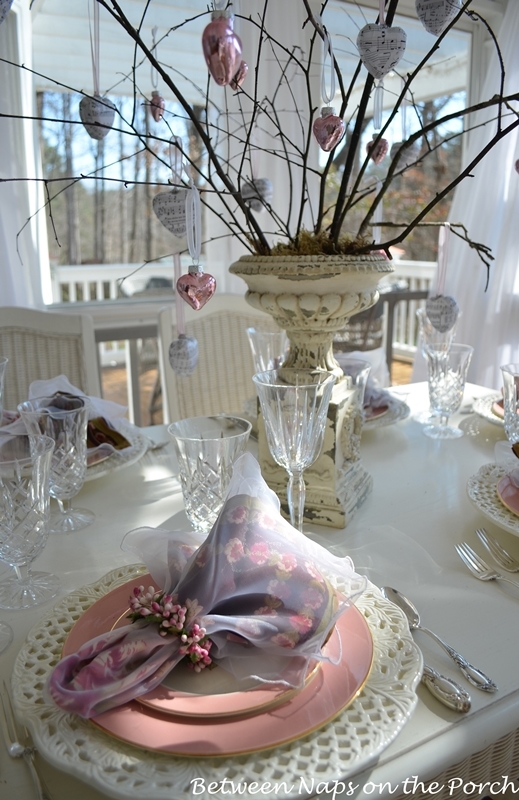 Your tablescape is just divine, Honey….very girly, feminine & sweet. BTW, I think the name of the china that Homer Laughlin made is "Cavalier Eggshell"
Thank you for hosting TT again & again. Best day of the week!! Thanks so much for hosting TT each week. I rush here every Thursday, just to dream. Your Tablescape is so lovely this week. I adore the magnolias. What a lucky find! Thanks again. Susan, this is one of my favorites from your porch.I love the sheer napkin overlay. That's just beautiful. I've never seen one like that. I also love the dishes. I saw some wonderful Laughlin ones with Japanese magnolias in the middle. It was all I could do to resist them. And I look forward to the tutorial on the hearts. Goodness! Your screened-in porch is full of sunshine during the winter months, isn't it? Thankfully, you have those beautiful trees to shade out the hot sun during the summer, huh? I love the pink dishes. The 'blue hour' is certainly beautiful but also kind of eerie looking. Maybe that's where the phrase "once in a blue moon" came from? Oh girl you're killing me. Got nothin but brown here in Utah. Love love your cheery table. Gorgeous setting! I love your charger plates and how you used the sheer napkins over your solid napkins. It all looks so light and serene with the sheers on your porch as well. Fabulous photos! Susan – thank you for allowing me to link-up to your Tablescape Thursday blog! Your table is beautiful and so inspiring. I love everything you design on your porch. My porch is not as large and I am totally jealous, but I do love spending time out there. Love those napkins!! Love the tablescape! So romantic and pale. The hearts are just adorable too! I do not want to be repetitive, but come and see you is always a pleasure …..
You are a great source of inspiration for me! Give me a great charge …. The tablescape is gorgeouus, good to invite all our girlfriends for a nice lunch. I love the plates. And the blue hour is just so amazing. So beautiful! Well done!!!! Thanks so much for sharing and spreading the creativity and beauty – it's so inspiring! Looks great, Susan. In case anyone is looking for the light pink mercury glass hearts, I found some just like them at JoAnn's Fabrics back in January. Oh I just love it….great job !!! Don't know that I've ever seen your porch in February. What a new and interesting perspective. It looks so fresh and crisp. Quite lovely – all of it. Clever centerpiece. Beautiful—beautiful—beautiful tablescape. I adore your sweet hearts!!!!! and your gorgeous porch!!!! As usual your table is exquisite! I love the dishes with the gardenias on them, especially since they are one of my favorites, I love the scent. Stemware is gorgeous and most marvelous is your centerpiece. I just made my first tablescape for Valentine's Day and I had a lot of fun. Of course, it's only my first, so I still have a long way to go to get into your league. Hi Susan!! Oh, your porch just drives me crazy! I love it!! and it "tells" me Spring will soon be here!! Thanks for all the "loveliness"! 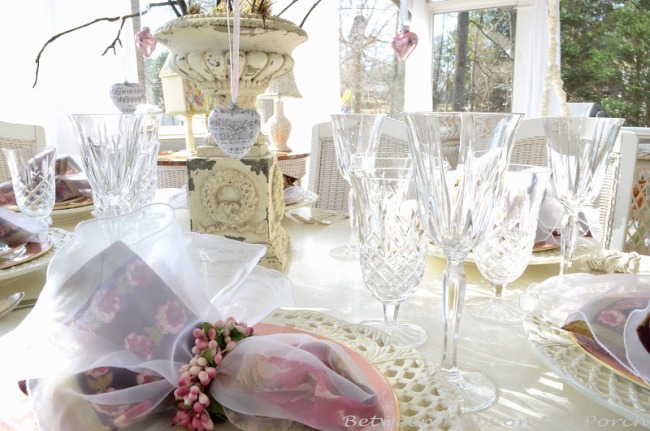 charlotte says Love the table setting….. I have seen kids feather boas at the dollar stores in the past…maybe they still have some? I am sure they could be separated for your tree project! I am having a hard time posting??? Not sure what I am doing wrong, but glad this one made it. Your tablescapes are to die for! I follow you on Google Friend Connect but understand that it's going out of service at the end of this month. I don't see you on Linky Followers, the new link tool. I have joined, if you decide to join when I see your icon on my widget, then I can click on to follow you back. It's all at the end of my blog at, "citicasita.blogspot.com". It is being sponsored by "It's So Very Cheri" by Cheri herself. You master the Art of the tablescape and to receive such a nice words from you is really special to me . Wishing you a lovely Valentine's Day to you and yours! 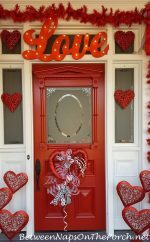 Your Valentine's wreath is LOVELY! So romantic!! Thank you so much for hosting! I've linked up a couple of posts from my 30 for 30 outfits! susan, as you know i love this blog and i love the chargers that are carved and i have to have some. i think you said the were from Neiman Marcus or Frontgate, but do they have a pattern name i could do a google search and possible find some or you are going to have to sell me those. 🙂 they are beautiful! Thanks! Unfortunately the chargers don’t have any information on the back of them, it’s just blank. I just checked a file where I had the old receipt and they were from Horchow in January 2008. All it says on the receipt is: Pierced Chargers and the item number HCOF8_H2U26. I’m sure that item number won’t be of any use now. Neiman Marcus and Horchow are owned by the same company I believe, so I always look on both sites since they carry a lot of the same things. They need to bring these chargers back because a lot of folks have asked about them. If I ever see them again anywhere, I’ll definitely let you know. I have been following your beautiful ideas ever since I started learning to use a computer (still learning I might add) I don’t have a website and put yours there (probably wrong) sorry if it is.But on your porch I was just wondering if your porch is just screened in. I have a screened porch , would love to use some of your ideas. Do you use yours all year if it is just screened in? We live in S.C. and its alittle chilly out there ! Just wondering. So sorry if I did this wrong and put your website name!! Again you do some beautiful decorating!! Where were you in my decorating life back in 2012? This so cute. I was looking for ideas for the month of May and this pops up. Plus with all this freezing rain, this brightened my afternoon. Another beautiful tablescape! I get so many great ideas from your blog; thank you so much for sharing! The pink china is adorable and what a bargain for you! I think the sheer sheath over the napkins just add to the elegance. 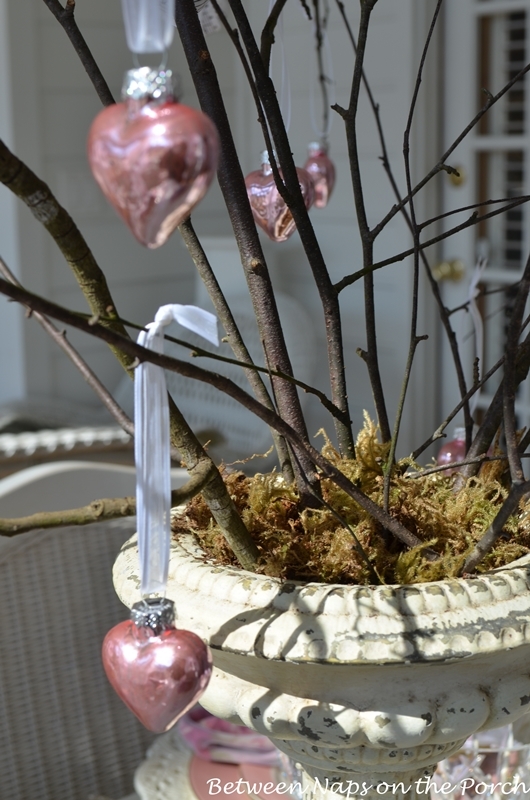 Love, love the Mercury glass hearts! I shared about your blog to a group of my friends today and I think they too are going to be just as delighted as I am with all your talent and resourcefulness!